Summary: How much does cavity wall insulation cost, average labour costs and average material costs. Did you know that up to third of your home's heat is lost through its walls? Filling the cavities between the two outside walls of your property with insulation will significantly reduce your energy costs. The insulation material prevents convection currents within the trapped air thus making air the prime insulator. New buildings often have an insulation layer already built in, usually from rock wool or glass fibre. However, if you have an older property choosing to make the investment of insulating the walls' cavities will more than pay for itself in energy savings and make your house warmer in winter and cooler in summer. You will usually recoup your investment in about three to four years. You may want to carry out soundproofing work in your home for a variety of reasons. Noisy neighbours, next door or above, can be a real headache and have an adverse impact on your quality of life. If you have a musician in the house and want to reduce the noise levels of their practice sessions – for you and the neighbours, then soundproofing could be an effective solution. You might also want to block other sounds in your own home such as noise from the bathroom or the hum of a washing machine in the utility room. If you are converting a property or building a new one then sound levels must comply with building regulations passed in 2003. Homes built since then will be covered by these regulations but older properties won't, unless conversion work has been carried out. If noise from your upstairs neighbours is bothering you then bear in mind that it's easier to soundproof a floor than a ceiling to block out unwanted noise. It's also harder to soundproof a room after it's been built, but not impossible. You can get soundproofing materials for the walls, ceilings and floors. The systems for walls come in a variety of thicknesses – up to six inches for some – so bear in mind you will reduce the space in the room being soundproofed. Complete DIY soundproofing systems can be bought which aim to reduce the amount of airborne noise travelling through badly insulated party walls. They are also fire resistant to comply with building regulations. These systems can be easily fitted if you have some DIY experience, or with the aid of a handyman if not. Slimmer systems can simply be glued or screwed onto existing walls, by taking out the skirting boards and getting a qualified electrician to remove any electrical fittings and re-install them into the newly insulated wall. Fitting a thicker system is a bit more complicated but will provide more effective protection from loud noise and music especially bass beats. You will need to erect timber wall battens then infill with the noise insulating material before finishing by fitting acoustic plasterboard. You can also fit in acoustic vents, which allow air to travel into the room while still reducing noise levels. If you want to cut down on noise from above then simpler, lighter systems can be glued onto the existing ceiling. More drastic, but more effective, is to take down your ceiling and bond the acoustic material to underside of the floor, between the joists. Fit bars across the joists then add plasterboard to the bars. Again a qualified electrician should remove and re-install light fittings. Soundproofing a floor is easier, though you may want to get a carpet fitter in to do the work. The job entails gluing or nailing one or two layers of soundproof material, sometimes followed by underlay, onto the floor. The exact products used will depend on the level of noise reduction you are hoping to achieve. A floating floor system is effective against airborne and impact noise levels and again it should be possible for a DIY-competent person to carry out the work, though a carpenter or carpet fitter could be employed to help. It's worth remembering that many soundproofing materials are heavy and you will probably need someone to help you with lifting and carrying. Other soundproofing measures include installing double or even triple glazing. This is a common solution to keeping out traffic and other street noise. You might want to block other sounds in your own home such as noise from the bathroom or the hum of a washing machine in the utility room. You can get soundproofing materials for the walls, ceilings and floors. 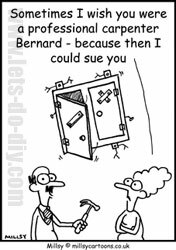 It should be possible for a DIY-competent person to carry out the work, though a carpenter could be employed to help. The cost of soundproofing will depend on the size of the area to be covered and the type of soundproofing to be installed. It is likely to cost a couple of hundred pounds to soundproof the walls of a room for example, with the cost of an electrician on top. Remember to budget too, for redecorating the new wall or ceiling. It's easy to buy the products either online or in DIY stores and they'll come with detailed instructions. You can also call in a professional domestic soundproofing firm though this will cost more. Typical quotes start at £60 per square meter for labour, material and VAT. Whether you do it yourself or employ a soundproofing firm, carrying out the work should ensure a quieter, more peaceful home. It's easy to buy the products either online or in DIY stores.